Insurers are sharpening their focus on the speed of claim processes to enhance customer experience. Nobody wishes for the day when he has to make a claim against an insurance policy, but that is precisely the day insurance policies are meant for. The insurance premium that you pay will be worth it if you are able to sail through the crisis without going broke. This is also the time when an insurer can make a difference by making the claim process easier for the troubled customer. This is an era of internet, where word of mouth resonates fast and loud across social media platforms, amplifying both positive and negative experiences. No company wants to be seen on the wrong side of customer experience, and insurers are focusing on improving their claim processes to be on the right side. "For years, insurance companies have mostly focused on development and automation of various business processes, which are recurring in nature and require less decision-making skills across the value chain," says Kalpesh Mehta, Partner, Deloitte India. "The focus, however, is now tilting towards exploring automation of more complex and risky processes such as insurance risk assessment, claim evaluation, claim settlement, etc.,"he adds. Many insurers have changed their claim settlement systems to accelerate the process and with technology playing a bigger role in this, it has become more user-friendly. "Filing a claim online is simple with a lot of information being pre-filled. Customers can also attach scanned documents for faster processing of claims," says Mehmood Mansoori, Member of Executive Management, and Group Head, HDFC ERGO General Insurance. For motor and health claims, policyholders prefer a place of service close to their residence or workplace, but may need an insurer's support anywhere. So insurers that have a large network of hospitals and garages have an edge. Many have identified this opportunity and are working on increasing their service footprints via new collaborations. Timely settlement is not only good for beneficiaries but also the insurer as it creates a healthy customer experience, which drives positive word-of-mouth publicity, attracting new business. The insurance regulator, Insurance Regulatory and Development Authority of India (IRDAI), has also made complacency costly by mandating penal interest payment if the claim is not processed within 30 days. Life insurance: IRDAI has mandated life insurers to not reject claims if the policy is three years old, unless there is a fraud. "Insurance companies are now looking at claims settlement within 24 hours to 2-4 days. They are reviewing the turnaround time between intimation date and required completion date," says Mehta of Deloitte India. Leading life insurers are working towards shorter turnaround time. "Our endeavour is to settle claims and process claim payouts within a week of completion of all claim formalities. We also have a dedicated 'Claims Helpdesk' at our head office to address claimants' queries related to claims process. After processing, all claim payouts are electronically transferred to a beneficiary's bank account," says Anshuman Verma, Chief Marketing and Digital Officer, DHFL Pramerica Life Insurance. Speedier claims, however, come with a risk of fraudulent claims getting through. Technology can help here. "Fraud analytics has helped in building a better early warning system for claim processing. Digitisation has fast-tracked the whole process. Paperless and digital ensures speedy disposal of claims and living benefit settlements (an advance payment on death benefit)," says Sanjeev Pujari, President-Actuarial and Risk Management, SBI Life Insurance. "Our claims paid ratio of 98.26 per cent in FY17-18 is backed by automated claims processing system, which uses analytics models to identify clear cases and process them immediately. A claim is settled in an average of six days after completing the documentation, and a third of these are settled within a day," says Manik Nangia, Director Marketing and Chief Digital Officer, Max Life Insurance. Motor claims: Vehicle insurance is a segment that faces frequent claims, and the speed of claim processing here has improved. "The average turnaround time for cashless as well as reimbursement is four days, excluding the time taken for the vehicle repair. Typically, 4-6 per cent of total motor claims come from third-party and theft put together," says Sasikumar Adidamu, Chief Technical Officer, Bajaj Allianz General Insurance. The next frontier for insurers is to adapt and innovate according to smartphone usage and mobile platforms. "For motor claims, our customers can use our mobile app to conduct a self-survey of their vehicle, and submit pictures and videos. In such cases, we ensure the claims are responded to within an hour. Customers can also register motor claims through the IVR service, without having to speak to call centre executives," says Mansoori of HDFC ERGO. Health claims: The claim processing experience and turnaround time in health insurance policies tends to dictate whether the person will renew the same policy or buy a new one. So, it's no surprise that health insurers are taking steps to improve this experience. ICICI Lombard, for instance, has come up with an Artificial Intelligence (AI)-based technology to facilitate instant health insurance claims approval. With this, a traditional cashless claim request can be processed in a minute versus the average 60 minutes it generally takes. "We have an e-cashless process, wherein the hospital can put the cashless request directly in our claims system. This reduces the turnaround time and increases productivity and transparency. With a facility called eClaims, the insured person can directly submit claim documents online," says Sanjay Datta, Chief-Underwriting, Claims and Reinsurance, ICICI Lombard General Insurance. However, efficiency has to also extend to external players like hospitals and third party administrators (TPAs). "We have adopted a robust claim-tracking system for TPAs. It concentrates on key parameters such as bar-coded tracking of claim documents, real-time claim tracking, e-cashless facility for planned hospitalisation, GPS-enabled claims app for identifying network providers, facilities, tariffs, images, etc, online booking of health check-ups and feasibility of ordering from online pharmacies, etc," says Prasun Sikdar, MD & CEO at Cigna TTK Health Insurance. Cashless claims: Policyholders have the option of getting reimbursement for treatment expenses or motor repairs on their own, but this means more paperwork, a longer processing period and follow-ups. Cashless claim and ever-increasing access points are changing this. "Around 40 per cent health claims these days get processed in cashless mode. 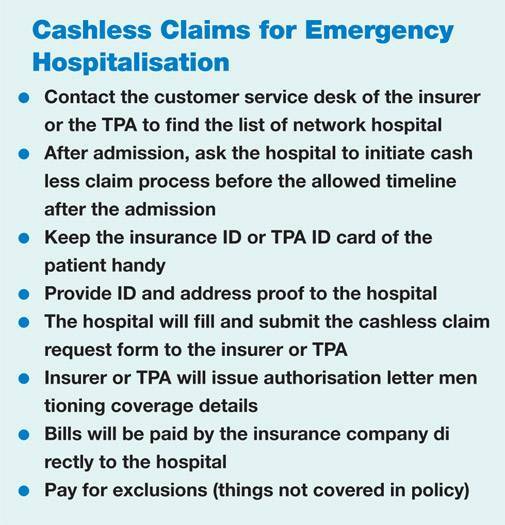 We have seen cashless claims increasing year-on-year because it gives customers a hassle-free hospitalisation experience. Most high-end procedures, surgeries, high claim amount-cases are also received on cashless basis," says Adidamu of Bajaj Allianz General Insurance. In a cashless mode, the payment is settled between the insurer and the service provider. The only thing the customer has to wait for is pre-authorisation. According to Ashish Mehrotra, MD & CEO, Max Bupa Health Insurance, the company's 30-minute cashless pre-authorisation promise provides quick and seamless service at point of claim. "To adhere to the promise, the company has an in-house claims settlement team that deploys technology," he says. "Claims risk assessment will be more preventive and predictive to facilitate more and speedier claims settlement. The intent would be to analytically study customer data and price it appropriately to avoid dubious claims. Risk of fraud will be regularly eliminated through AI and analytics. Telematics has brought a paradigm shift in motor insurance. Few of the technologies that would change the way an insurance company analyses customer behaviour would include Robotic Process Automation (RPA), cognitive intelligence, harnessing data from sensor devices and other artificial intelligence technologies. 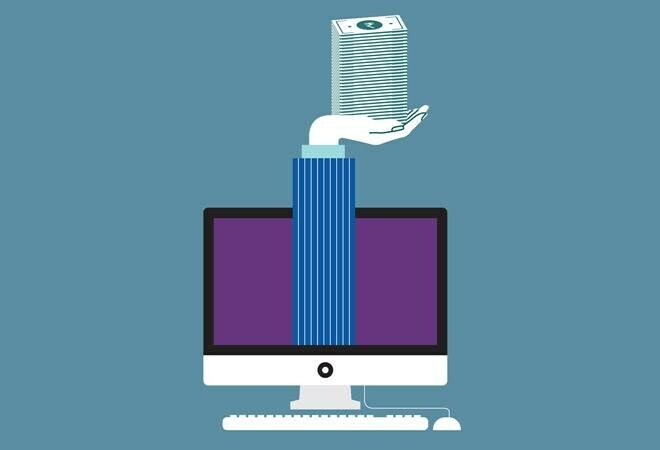 These would enable a quicker turnaround in claim settlement with higher efficiency and accuracy," says Mehta of Deloitte India. With technology throwing up more solutions, policyholders can look forward to better claim experience.